FERGUSON, Mo. -- Police in the St. Louis suburb where a white officer shot and killed an unarmed 18-year-old black teenager have started wearing body cameras, according to the St. Louis Post-Dispatch. Ferguson Police Chief Tom Jackson told the newspaper officers had the devices on during a protest march Saturday over the Aug. 9 shooting of Michael Brown by Ferguson officer Darren Wilson. Jackson said the department was given about 50 body cameras by two companies about a week ago. Company representatives offered training to officers Saturday on using the devices that attach to their uniforms and record video and audio. Jackson said each officer will get one to use. The chief told the Post-Dispatch officers were able to capture video images of crowd members taunting officers during the demonstration on Saturday. "The quality is good," he said. Officers are receptive to the cameras, he added. "They are really enjoying them," he told the newspaper. "They are trying to get used to using them." 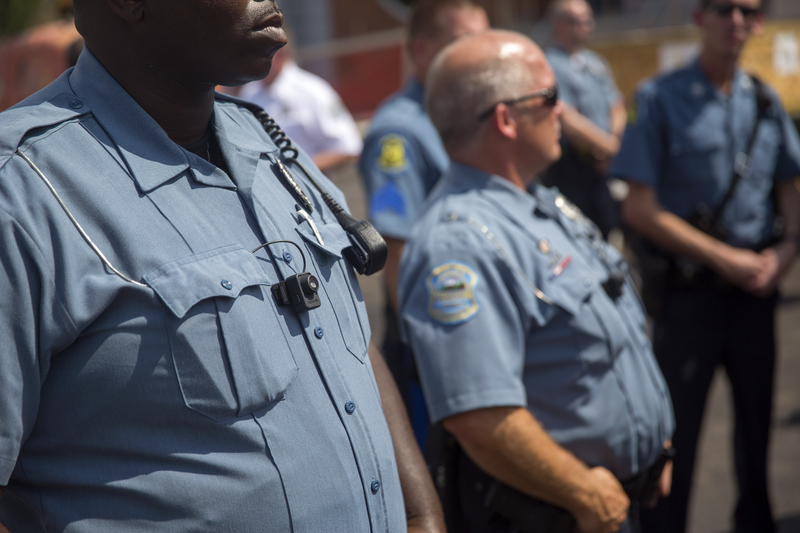 CBS St. Louis affiliate KMOV reported Friday that the officers were getting the training. The use of the cameras comes amid increased attention on police use of force in the wake of the Brown's death. Following the shooting, local police in Ferguson donned riot gear and fired tear gas and rubber bullets at protesters who refused to disperse and, at times, broke into nearby businesses. Jackson said body cameras would have made a difference in the investigation of Brown's shooting. Separately, two separate web pages raising money to back Wilson suddenly stopped taking donations without any explanation over the weekend, the Los Angeles Times reports. The pages, on the crowd-source fundraising site GoFundMe, had raised a total of $433,000, the newspaper says. Since Brown's death, calls have grown for police to wear the cameras to help clarify how certain incidents unfold. "It seems to me that before we give federal funds to police departments, we ought to mandate that they have body cams," Sen. Claire McCaskill, D-Missouri, said Monday, the Springfield News-Leader reports. "I think that [body cams] would go a long way toward solving some of these problems, and it would be a great legacy over this tragedy that's occurred in Ferguson." A federal lawsuit filed Thursday alleges that police in Ferguson and St. Louis County used excessive force and falsely arrested innocent bystanders amid attempts to quell widespread unrest after the fatal shooting of Brown. Policing in the digital age means every moment, every incident can be caught on camera - and sometimes, followed by accusations of excessive use of force. But now, hundreds of police departments are exploring whether their own cameras might create a more complete picture of a scene, CBS News correspondent Teri Okita reported. Rialto, California Police Chief Tony Farrar believes outfitting police officers with body cameras is going to become the norm. "This is something that's changing the face of law enforcement," he said. The American Civil Liberty Union's Peter Bibring says his organization, which normally opposes surveillance of citizens, endorses the body cameras, and not just in Rialto. "A picture's worth a thousand words and video, many more," Bibring said. "And video, from the perspective of the officer, is going to be an invaluable tool in determining why an officer acted the way he or she did - and whether he or she acted appropriately." Laurel, Maryland Deputy Police Chief James Brooks told CBS News that all of his street officers now wear cameras. To Brooks, it's all about accountability. For example, in the case of a drunk driving incident, the officer would only have had his account without the camera. "So now, you are going down the road, you see a car maybe weaving back and forth, you can turn your camera on and start to capture that evidence that you may want to present for a DUI case in court," Brooks said.